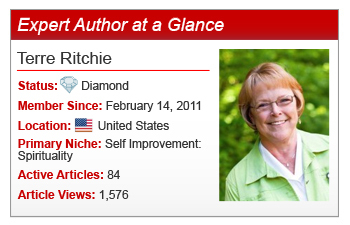 Compassionate and expressive, Expert Author Terre Ritchie began writing articles at the suggestion of her editor. Although haphazard in the beginning, themes began to surface and Terre found herself thoroughly enjoying writing. Inspired by her rich history of travels, professions, and hobbies, as well as by those closest to her, Terre opens herself to her unique experiences to provide quality, original articles. “My style is open and honest about my life and experiences in the 63 years I’ve been alive,” Terre commented. “There is much to write about because I haven’t been a sedentary person. I travel, I’m involved in many organizations and I’m a learner,” she continued. Marketing is not my forte. I leave that to the experts at work … I just write … If you worry about the marketing, it takes all the fun out of writing. Let someone who has a skillset in that area take it over. Maybe your 16 year old grandson! Topics are sometimes what stall me for a day or two. Then, I just relax and stop worrying about it. God usually gives me a story that leads into a topic that leads into 5 or 6 [article]s. It’s amazing how that happens. Keeping it in the first person when the story starts to flow is sometimes difficult. I want to include so much that I get on a rabbit trail and have to divide that story off into another [article] for some time later! HA! Once you find pleasure in writing, it takes over – you keep your creative engine running for the next idea to share. If you find yourself overwhelmed by marketing your writing, take Terre’s advice to find someone who can and then you can focus on the quality of your article writing. In doing so, you will find success and begin to enjoy writing! Do you have a question or comment for Terre? Feel free to leave it in the comments section below. These are great inspirational and motivational tips. You have really inspired me with a strong insight to developing my writing skill. Thanks for sharing this great experience. Thank you Ivan. Blogging was all new to me until my editor said, you need to do this! She pushed me into something I had no idea about and I’m glad she did. I hope your writing takes flight soon! I love your last statement: “Once you find pleasure in writing it takes over.” Writing has certainly been that way for me. There are periods where I go into a lull, finding it hard to get started writing. And then I begin, start to feel good, and the writing just flows, often from one topic to another. Thank you for your kind comments Dr. Erica. I agree with the ‘lull’ part. It’s been weeks since I’ve written an article and I know I need to begin again but life sometimes takes over! Here’s hoping your letter inspires me to do just that! Hi Terre, congrats on the great exposure. Is it really true that you dont like the marketing side of things? It really isn’t that hard. Once again, congratulations! Great article. It reminds me of my school days when I used to JUST LIKE writing. I just loved writing class (English). This article sort of prompts me to rediscover my “ability” to JUST LIKE writing. whether you’re expanding your mind by studying or travel, by talking to well-travelled people or through doing a personal development course, you have the chance now to broaden your horizons, this will help you write wonderful story. Thanks Mark. I love new experiences and travel is an easy way to get those. I’ve been in Eastern Europe extensively and other places around the world. Meeting new people and growing through those friendships has inspired me in many ways. It’s all part of my life’s story that has yet to be written! Thanks for your encouragement.